The trucker who lives next door is seldom home. He’s a long-haul trucker, he’s over-the-road. He earns good money and does not spend. There’s something ascetical about him, something well read and wise. He’s forty. His hair is long. He wears jeans and combat boots. Sallow and haggard, his face is handsome nevertheless. His willowy wife does not ride with him but stays at home. They have no children. The wife is solitary, long-legged and tan. She has a ponytail of sandy-brown. She smokes Marlboro’s. They do not rent but own. The wife spends hours in her garden, or she reads in her backyard. Her eyes are pensive. She waves to us but rarely speaks. The trucker who lives next door arrives at unexpected hours, on unexpected days. Emerging from his rig, he has the leanness of a desert prophet about him. I imagine him eating very little while he’s out on the road. He transports the goods from north-to-south. He hauls the freight from coast-to-coast. He kisses his wife in the driveway. They hold hands and enter their tidy cottage together. They shut the door behind. Sometimes, on holidays, his rig will sit for three or four consecutive nights along this residential side street. It sits gleaming in the dark. The trucker loves his rig; it is his home away from home. Once, in the middle of the night, I heard a gentle noise outside and crept up to the window. The trucker who lives next door was polishing his semi in the moonlight. The semi is midnight-blue and chrome. Here on the ragged edge of this desert town where the ancient railroad tracks lie rusting in the grass, the frontiers begin. These are the frontiers the trucker crosses and re-crosses year around. Our town is like many western towns, with its looping river and cauliflower clouds, its one Masonic lodge and the hard clean skies above, and in the distance, fields of clay where woolly mammoth and dinosaur once knelt down in the soft earth to die, and a billion bison bones fossilize in the ground. Beyond the backyards, the interstate curves off into the intricate horizon, and the distant cars make very little sound. You’ve opened a door to an interesting and rarely looked at insight and profession. Truckers are often the overlooked guardians of the road that can sometimes be a nuisance to the impatient driver who travels from coast-to-coast. You’ve almost given a nostalgia and personified the semi driver to where one can get lost in your writing and assume an almost romantic vision. Quite a gift you have there Mr. Harvey. Nice. You and Tom Waits should share a beer, swap descriptive narratives. I buy a ticket. Probably show up this time. Please. I’ll believe you’ll show up when I actually see it. Kidding, of course. It’s good to see you here, Jeff. I hope you and Cindy are feeling better. Thank you for dropping by and biting the ears off your chocolate rabbit. This is a striking “bit” of writing! Several years ago, a road trip deposited us in Holbrook, Arizona, at a Holiday Inn Express within the proverbial football field from I-40. 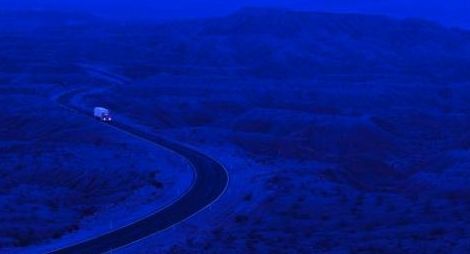 That evening after enjoying dinner and margaritas at the weary looking El Rancho motel restaurant, we returned to our room and I stared out the window into the desert blackness and the parade of tractor trailer lights on the interstate. I was mesmerized. My eyes were captivated by the constant stream of illumination, the variation in the each truck’s details, and the range of pride implied by the displays. I wondered about the people who are drawn to that life. I thought about the combined aspects of isolation and camaraderie. I think I tried to convince Jeff that we could leave everything behind and join them. I had never felt so peaceful and content. Then again, those were really generous margaritas. It’s the allure of Americana, which captivates me endlessly. I once watched an ant man-handle a pebble his own size out of his home, down the side of the ant hill, and at least a foot and a half away (which in ant terms must be huge). I stood there and asked myself. Did he not like where the pebble was in his home? Did he think it looked better off at that distance? Or did someone else, higher up in the pecking order, just say, “You there, get this rock out’a here”? I then questioned if an ant could actually “man-handle” anything or if that was just an example of personification. Following that I wondered if ants make that “Vroom Vroom” sound when they carry stuff or if that was just more personification mixed with an onomatopoeia. Ants sure are complex creatures. Hiya Jeff! Your comment reminds me of the experience I had many years ago when I went to the top of the John Hancock building, in Chicago. I was staring out the window, 1500 feet down to the sidewalks below, and it suddenly occurred to me that all the people down there looked like ants. But it wasn’t because these people looked so small. It was because of the giant pieces of bread they were all carrying on their backs. Ah, Touche! That one boule’d me over.